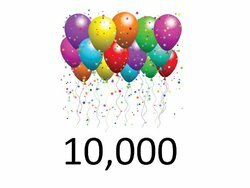 10,000th Thread In This Forum!! Congrats Everyone - Here's a Mystery Box Give-Away! What better way to celebrate the Community's involvement then with a give-away? A mystery box give-away in fact! And just like you gave to this Community by contributing in these threads, you will be giving to another Ninja in this give-away. HOW you ask? Simple .... TAG 1 person in your reply and if your number is drawn it is the person you tagged who wins! So you took part in giving this Mystery Box to them as well! So then maybe they owe you a solid or something. This is awesome! Congrats to all here on HDN for making this place great! @Noodles for all the crazy good designs that you make! @tridon One of the pillars of HDN. Gotta tag my mate @larson1977 ! Thanks for the awesome give-away! What a great play! so for me, attempting to avoid the obvious saints on here - @StifflersDad as if it werent for their kindness, I wouldnt have gotten the Doctor Strange double lenti steelbook from Blufans consider this a shout out thanks for that. by the way, great idea and gesture here guys - nice way to pay things forward. Will tag @howarmat for posting first! @virkia — When you get the mystery box, you can show us all the other covers that have been used for those movies in other editions. Good luck, fellow art critic! Awesome work folks, I’ve seen this forum go from quite small back in 2011 to enormous now here in 2018. As @bloodsnake007 would say: THIS PLACE FU.CKING ROCKS !! I’m going to tag @C.C. 95 for the giveaway. I’ll tag @Aniv. The one person in this forum that I’ve met in person and a great guy. Thanks for getting me here at HDN. thanks for the giveaway Sir @Wreck !!! Everybody loves a mystery box!